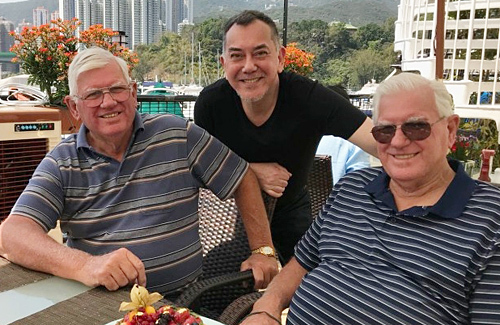 What started out as a Facebook post to look for his father has led 56-year-old Anthony Wong (黃秋生) to meet two half brothers that he never knew about. 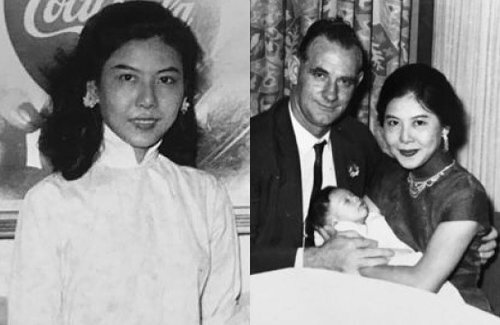 On March 20, 74-year-old twins, John William and David Frederick Perry, traveled from Australia to Hong Kong to meet with Anthony. The three men were emotional as they embraced each other and felt an immediate connection as family. “I’m very happy. It’s amazing, impossible, a miracle,” Anthony described of the meeting. Through his half brothers, Anthony learned that his father, Frederick William Perry, had already died in 1988. The Perry brothers said that their father never told them about Anthony and his mother. Anthony’s father walked out on his life when he was only four years old. Struggling with his self-identity while growing up, Anthony was often bullied because of his mixed looks. His mother, Wong Chun Yi (黃尊儀) worked as a maid in order to make ends meet. She woke up at 3 a.m. to go to work and did not return home until 12 a.m., and suffered from leg pains due to the long working hours. Appreciating his mother’s sacrifices, Anthony has always been a filial son. Anthony knew little about his father, except that he was a former British government official. In 1997, Anthony went to England with his mother to look for clues about his paternal family, but without success. Last year while drunk and possessing little hope, Anthony posted on Facebook that he was looking for his father. After seeing his Facebook post, BBC became very interested in Anthony’s search and interviewed him this February. A Facebook page was subsequently set up to help with the search; within two weeks, clues started pouring in about Anthony’s paternal family. At the same time, John and David’s cousin in England alerted them of the BBC story. When they watched Anthony’s interview and saw a photo of their father, John and David were incredulous. Their mother had died in 1972 and they believe she did not know about Anthony either. After speaking on the phone with Anthony, John and David decided they must go to Hong Kong. Closure. He’s been yearning for that family love. that’ beautiful, glad he found what he desired for. Congratulations to the brothers. What a miracle! Reading between the lines, I suppose Anthony’s father felt his obligations were with his wife and family in Australia. But it was cruel to just cut off Anthony’s mother and Anthony and not even offer financial assistance to help them when they needed it the most. The timeline seems as if Anthony’s father had worked in Hong Kong and raised his twin sons there. After the Perry brothers went back to England, Anthony was born afterward. Anthony’s parents were together for 5 years before his father walked out and later moved to Australia. @jayne Lovely story. Saw this in chinese newspaper, thought father was alive. I don’t agree about the father’s motives and intentions. He didn’t choose. I believe to him Anthony’s mother was just a fling which resulted in a child he never wanted anyway, hence it was so very easy for him to walk out of him. Fine, if he didn’t want the woman, understandable. He got a wife already and children. But if the previous article was correct, the father later on totally cut ties and financial support and was a total douche. Which is why the twin brothers were shocked and finally right the wrong their father did by acknowledging Anthony. Anthony is far better off without douche father but am happy his brothers feel differently. The father – douche jerk father. @funnlim I agree with you! The dad was definitely a douche — the part about him cutting off financial support and refusing to even talk to Anthony’s mother on the phone until she paid the fee for the phone call really got to me…oh and the reason for the call, Anthony being extremely ill and needing surgery but he wasn’t even willing to pay for that or to go see him…pretty much showing no concern at all…like you said, wanting to cut off ties to the mother is understandable (still douche bag but understandable) but to push away his own child when he needed him the most? To me, that’s unacceptable, especially when his child’s life was on the line (I mean, Anthony could’ve died at that time if the man who later became his stepfather didn’t eventually step in with the money to pay for whatever medical procedure he had needed). It’s good to see that Anthony’s half-brothers were nothing like their father. From the video clip, they sound like very decent, good people. I was touched at the end when they were all at the airport (the brothers getting ready to fly home) and one of the brothers told Anthony they’re the Three Musketeers now…Anthony looked like he was holding back tears…I actually very nearly cried at that point…. @llwy12 I too felt happy for Anthony that he found his two brothers who embraced him as family, and who can fill in the gap about his father’s life if he wants to be updated on those years. Anthony is a big,strong tough man, and I could tell he was holding back tears when his brothers left for Australia. That was so touching to watch. I always used to think Anthony was an angry man who bullied fellow actors/actresses. After finding out about what he went through in his life, though I might not condone a lot of his actions, I can understand and not hold it against him. It was not easy in his era growing up in Asia as the child of mix parents. Then he was bullied on top of that, and carried the painful burden in his heart that his dad just up and left him and his mom. . That is a lot of pressure and heartache for any child or even adult to live with. Add the fact that single parenting was frowned upon so viciously in those days, still is in Hong Kong. Anthony has been through a lot. I am beginning to get a better understanding of the man, and he is a tough, strong man. He has to be, all those trying times has made him the in-your-face tough cookie that he is. Anthony is a survivor, that he is. I am so happy that he is building a bond with his two brothers. His search turned out more than fruitful. He found closure about his dad, and he found two brothers, he gained family. @bubbletea Agreed! I’ve been reading some of the other articles about Anthony’s reunion…looks like he also has an older sister now in Australia named Vera Ann and they already have plans to meet up over there in August. Anthony is a changed man now, as he realizes where his angry personality comes from and knowing more about what his father was like, he can look past the resentment now. He says that now he can feel good about using the name Perry and plans on applying for his sons’ names to be changed (he said most likely he will still keep the surname Wong because of his mom but he feels he owes it to his sons and future generations to have them use surname Perry instead). @llwy12 wow!, it gets even better for Anthony in having a sister as well. This is wonderful news.Thanks for the update. Glad that they are going to meet up in Australia in a few months. So, so happy for Anthony. You know, his dad might have been a douche, but it worked in Anthony’s favor. How? ?……seeing his mother struggle to raise him on her own made him a protective, filial son. I’m sure he wanted to do his best to grow up and take care of his mom. That led him to become one of the most prolific, sought after actors in Asia. Hollywood has nothing that Anthony can’t live up to as far as acting is concerned. Sometimes, struggles make us stronger, better and more ambitious people. Looks like it worked for Anthony. @llwy12 He has missed out on blood related relationships. I think he does not want his kids not to miss the other chapters of his life – extended family love. I am sure he will bring his kids to meet with everyone in Australia come this Christmas. @funnlim This is probably the best closure to Anthony’s story. Anthony’s father caused a lot of hurt to Anthony and his mother, and even if he were alive today, seeing him again may only give them more pain. Since his mother is suffering from dementia, nature has helped her erase some of her painful memories. With his father no longer alive, Anthony can also truly let go of his past. I’m glad that Anthony has such warm brothers ready to welcome him as part of the family. Aww, sweet! Love family reunions! Definitely happy for Anthony being able to find closure after all these years. I teared up a little when I read the part about him taking his mom to meet his brothers and her reacting emotionally despite the dementia – it’s almost as though all she had suffered through can finally come to an end. What an incredible, heartfelt story! @llwy12 Indeed. Glad that Anthony found closure to his unhappy past and the brothers he never knew. It is very kind of John and David to reach out to Anthony. Anthony looked emotional when he bid his brothers good bye. So does this mean his father is a lots older than his mother? Because his father had died long time ago and his mother still alive unless he passed away with cancer or something? I thought Anthony is the oldest one no? He say his father walked out when he’s only 4 years old so that means his father already had another woman with a kid before he meet his mother? I just noticed he gave his brothers some of his selected DVDs. On top is Justice of Life? If I got the title right. I bet one of them is Infernal Affairs and also Ip Man movie he did. Anyway very touching. Still a douche father. @longhair84 Indeed. It is real. Why does he want to change his sons’ last name to Perry? Let’s not forget his dad abandoned the family; his kids shouldn’t be tied to such a man, especially one that doesn’t have any remote feelings for them. Anthony definitely suffered from the lack of a father figure, but going all the way to finding extended family and then changing his sons’ last names seems overboard. It doesn’t matter to me personally, but I think it’s a great injustice to his mom who raised him all by herself and deserves full credit. @coralie I believe he needs closure. And to do that, he needs to forgive the past and embrace the future positively. Anger begets anger. He said ‘I never knew I can still feel emotions’. I guess he meant ‘he is still capable of forgiving’. He will not be able to connect with his half brothers if he does not let go the painful past. Does he want to go to grave a bitter man? One wrong and hatred will not erase the past and make one feels happier. But forgiving his father and embracing his long lost other family may make him feel more complete. @mangotango he can forgive the past, but there’s nothing wrong with his current last name. he can still connect with his siblings even without the surname. his kids definitely don’t need to have that last name. it doesn’t mean there’s hatred; it’s just that… there’s no point in making the change that I can see, especially when he isn’t going to implement it to his name. @coralie He has a fscebook account called Anthony Perry I think. @coralie ya no way should he change his son’s last name to Perry. That’s very disrespect to his mom that took care of him by herself. It shouldn’t even be considered really. @mike I believe him calling himself a Wong is more anger towards dad and survival in Hong Kong society then (didn’t he say he had tough time being an Eurasian among chinese kids in chinese schools?) His love for mum is best magnified through his filial piety. If his mum can speak coherently, I am sure she would want her son to be happy instead of dwelling in anger and past. @mangotango if someone’s really over being angry, they’ll be indifferent. needing to change his/kids’ name to Perry is signifying something different. but if his original birth certificate really says perry, then changed to wong, now he wants to change back to perry…still seems extra lol. @coralie I understand where you’re coming from though personally I don’t see an issue with him changing his sons’ last names back to Perry. Based on what I’ve read, it sounds like Anthony does have the name Perry on his own birth certificate (he actually uses the Perry last name on his Facebook account), though the part I’m not sure of is whether he has the Wong surname also listed (depends on whether his birth certificate has both English and Chinese on it or only English). I also see it as Anthony’s way of letting go of his anger toward the past and embracing happiness for the future. I can certainly understand him wanting to change his sons’ names back to Perry because that IS their true surname, it’s just that he couldn’t bring himself to use that name “officially” (meaning on legal documents and such) because it never felt “legitimate” before. With this reunion and knowing that he DOES still have family who welcomes him wholeheartedly, in his mind, the Perry name is “legitimized” now so he is able to embrace that name now. @llwy12 indeed I couldn’t agree with you more. It’s indeed a closure for him and it’s about letting go and not to carry it to his grave. Whatever it is he is afterall a Perry and I think he wants his sons to carry on with his surname legitimately. Good for him. No more chip in his shoulder so he could move on. Isn’t the internet wonderful? I love happy endings but just can’t help wondering if the brothers were so welcoming to Anthony becos of who he is. If Anthony had been an ordinary guy would the ending be the same? @passingby His brothers said ‘Anthony is their brother whether he is labourer or actor’. They are already in their 70s enjoying their retirement like many other Aussies. IMO it is the spirit of generoisity of the heart and understanding of the difficulties which Anthony and mum went through.which made them reached out to Anthony. Anthony is a 56yo. I trust he can make better judgments on characters. I am sure his nsme is Perry in his birth certificate and so are his children though he called himself a Wong. His act of acknowledging Perry is indicative of forgiving his father. However angry he was with his father, he was still his father. His early years with dad seemed happy from the photos. Seems genuine to me…. If they were in their twenties and families to protect then it will be complicated. With well over half a century of life experience i’m sure they all treasure family members. @passingby Like the others said, it didn’t sound like it mattered to the brothers one bit whether Anthony was a famous actor or not. At their age currently, there is no need for them to care about that kind of stuff. So yes, I think the ending would’ve been the same. To me, the part that would’ve made things different was if he had located his brothers when his father was still alive…it probably would’ve made things more awkward. I don’t think Anthony could’ve asked for a better time to reunite with his brothers than that moment they did, as everything ended up working out for the best.